Penelope was found in a Kentucky barn. Fleas peppered her tiny body, and she was suffering from an allergic reaction to them. The hair on her face was thinning. So it’s all the more amazing that when Kaitlin Fitzpatrick and her boyfriend saw her on Petfinder they knew she was the one for them. 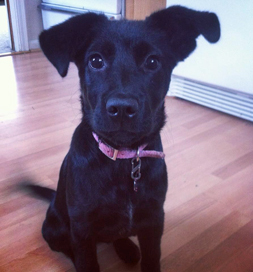 They went to Good Karma Puppy Rescue in Waterford, MI, the very next day and adopted her. Now she’s living a great life in a loving environment in Royal Oak, MI. But her favorite activity is cuddling with her new family in their queen-size bed. “Apparently her dog bed isn’t always suitable enough for her,” Kaitilin says. Who knew, when they adopted her, that she was a princess? But she has indeed become royalty in the family and enjoys all the special treatment that entails. Kaitlin admits the pooch is spoiled royally. “She has been a huge blessing in our lives, and we are so glad that we could provide her an amazing home after the hardships she endured as a young puppy,” Kaitlin says. One thing is certain, Penelope is one lucky dog.